On ANY front-loading BOILER that we sell, PLUS ALL top-loaders too! If you don’t see what you want listed, Write to me and I will list one for YOU! 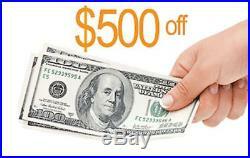 (ends Saturday August 8th). Look at the new photos; of one in production, before being tinned and 2 photos showing how the lid seals with the protruding lip on the base. For commercial purposes, a shop, garage, greenhouse, heat a pool, etc. FOR A RESIDENCE are now. In ALL 50 STATES! (A new FEDERAL EPA LAW kicked-in nation-wide on Jan 1, 2016). That means folks who have a shop (body, wood, auto, etc) or commercial business, greenhouse, barn, pool, etc. For you folks in Canada, the U. Spain, Europe and other countries overseas. 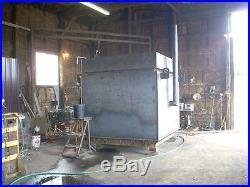 Wood Boilers are still available. People simply hate how hard the EPA boilers are to start and that it’s a full-time job to keep them running because. The wood HAS to be dried, under cover, for a minimum of two years! 500 (1/2) inch thick! It will heat up to 32,000 sq. 6L x 3W x 3H FIRE BOX. 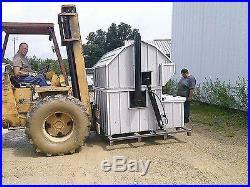 Load with your dump truck, back hoe, fork lift or front-end loader! Or Load from the side safely by hand in case of hydraulic or battery failure or repair! Ashes are cleaned out through the smaller door, below the side firebox door. Large Top Loading Furnace! Load it with even MORE logs for even longer burn times in your log burner! Don’t load your log burner furnace multiple times per day as you do with traditional wood stoves. All types of fuel can be used to create hot water (heat) such as stumps, wood chips, brush, wood by-product, pelletized wood and of course, almost 6 foot long logs! This product is manufactured in Arkansas but made for the Great White North. RANCO Digital thermostat STANDARD with temperature readout. Standard (Armstrong Astro 30) pump to circulate the water to your shop/home, in addition to the one that circulates water from the bottom tank to the lid , to prevent hot spots. 427 Gallons for maximum reserve; over 420,000 BTUs in reserve, available to heat your home or building even if the fire goes out (due to no wood). Load with almost 6 foot logs ; no cutting or splitting! 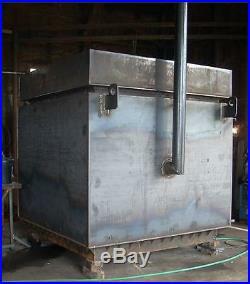 6 foot long firebox x 3 feet wide x 3 feet tall, not including the ash pan area = 54 cu. Compared to a max of 13 cu. Ft with our 340 model (over 4 times the capacity). Based on firebox (wood) capacity, it will heat 32,000 sq. In a PA type climate, loading it just twice a day with a good hardwood – like oak or maple; assuming the building is well-insulated. You could heat a 16,000 sq. Ft building, loading it just once a day. You could heat a 8,000 sq. Ft building loading it once every two days. You could heat a 4,000 sq. Ft building loading it once every 4 days! There is no negative to getting a bigger furnace because it is not like purchasing an air conditioner where if you get one too big, it becomes inefficient. It is simply like getting a bigger fuel tank so that it will hold more fuel and you will need to fill it less often. Comes with two pumps ; Armstrong Astro 30. One to circulate the water from the tank in the bottom to the lid, so that there aren’t any hot spots and one to circulate the water to the building (may need to be upgraded, depending on application). 12V Car or Deep Cycle Battery not included. Can be charged with simple solar panel or simple trickle/float charger. Side door for safer hand loading too AND ash cleanout! 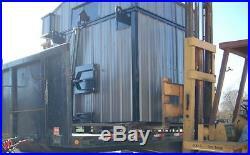 2000 lb lid acts like a trash compactor , smashing the logs info the firebox, with its weight and the hydraulic rams. 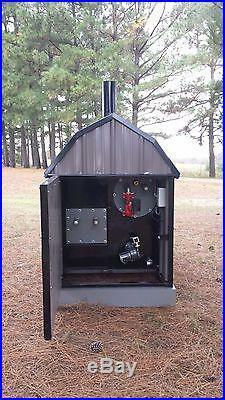 Can be made as a gasification unit just like all of our other furnaces. Our most popular: Model 633 (formerly called the 450). 6Lx 3W x3H FIRE BOX. Gallons in bottom, = 186. Gallons in top, = 239. Total gallons = 425. 54 cubic feet (Four Times bigger than our biggest Front Loader – the 340 model). In a PA type climate, loading it just twice a day with a good hardwood – like oak or maple, assuming the building is well-insulated. We custom build every furnace foryou , so when you order, you can specify YOUR choice of 20 great c o l o r s to best suit your surroundings! WE WILL CUSTOM BUILD ANYTHING THAT YOU WANT BECAUSE ALL OF THESE ARE BUILT TO ORDER! We just did one 9 feet long! Automatic, solenoid activated forced-air induction fan/blower SHOWN HERE. (No electronics) The blower in the back is a great aid in getting a fire started and kept roaring – JUST LIKE A BLACKSMITH’S FORGE! It also recovers the water temperature much quicker and burns the wood up more completely because oxygen is being fed to the bottom of the flame – like a blacksmith feeds his fire! View of port where the air blows in underneath (below)! The grate (still being welded in this picture) is made out of 3/4 inch bar stock. Raised lip on base, to seal lid, shown here Extra wide rope seal; wraps around the raised lip on the base, to seal the lid. Note the plate of steel, that is raided off from the lid, with a nice air insulating air gap. Logs can cost up to 2/3 less than split wood and burns more efficiently due to size. No need to cut and split wood, just put whole logs in and close the lid. Heat very large buildings. 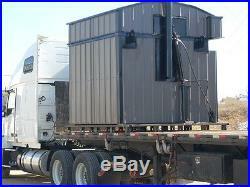 Such as: Greenhouses, Barns, Drive sheds, Garages, Shops, commercial buildings, etc. Load your Log Burner with machinery such as dump trucks, tractors, back hoes and fork lifts. On-Site and 100% paid! Who else offers that, who has been around 44 years? A lot of warranties only cover parts (not even labor)! A gentleman called me and told me his 2-year old C_____l B____r was leaking! All major problems such as leaks 10 years coverage on the water jacket Building Quality Wood & Coal Furnaces for 44 Years! Over 8,000 Different Color Combinations! 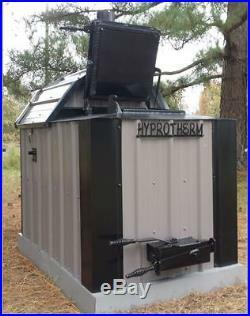 HyProTherm Furnace is a privately held company and was established in 1972. A Heating and Air company preceded it and dates back to 1950. Billy and his Dad, Gerald, were in the heating and air business for decades. They began to develop their first prototype for their own home, in the 60’s. Gerald knew there had to be a better way than to pay for oil, even though it was cheap back then. His main concern however, was to get rid of the smoke and ashes in the house. It was obvious it could cause serious health problems. Besides the soot all over the place was a chore to clean. Having the wood outside already, made the plan simple. Put the wood stove outside! Stick something like a heater core from a car in the plenum and it would radiate heat – and the hot water could be pumped from the outside. He developed a model for himself and continued to improve on it over the years. We were indeed the first! The last revision was made in 1978 and the furnace remains essentially unchanged, except for cosmetics, today. Now Gerald’s son, Billy heads up the business. We have been in business for 44 years and we are a family run business. We are a brick and mortar business in Salem, Arkansas and we are here to stay. We stand behind the quality of our furnaces 100%. We believe that we can give you a quality furnace and save you thousands of dollars on these great furnaces, at the same time. See My Great 100% Perfect Feedback! Apr-05-98 in United States. 100.0% perfect feedback. The item “TOP LOADER Log Burner Outdoor Wood Burner Boiler Furnace Stove Outside 32,000 sf” is in sale since Friday, May 12, 2017. This item is in the category “Home & Garden\Home Improvement\Heating, Cooling & Air\Other Home Heating & Cooling”. 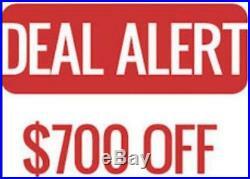 The seller is “aware” and is located in Salem, Arkansas. This item can be shipped to United States. ANNUAL LABOR DAY SALE – ALL WEEK! If you don’t see what you want listed, Write to me and I will list one for YOU! Look at the new photos of THIS model ABOVE. Also of one in production, before being tinned and 2 photos showing how the lid seals with the protruding lip on the base. For commercial purposes; a shop, garage, greenhouse, heat a pool, etc. FOR A RESIDENCE are now. In ALL 50 STATES! (A new FEDERAL EPA LAW kicked-in nation-wide on Jan 1, 2016). That means folks who have a shop (body, wood, auto, etc) or commercial business, greenhouse, barn, pool, etc. For you folks in Canada, the U. Spain, Europe and other countries overseas. 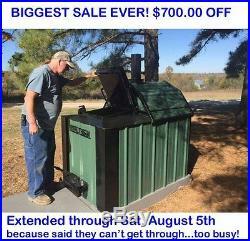 Wood Boilers are still available. People simply hate how the. EPA boilers are HARD to START. And that it’s a full-time job to keep them running. The wood HAS to be dried, under cover, for a minimum of two years! Is SHORTER than the one shown here. It will heat up to 21,000 sq. Ft The 450 is pictured here but the 316 is just 2 feet shorter See photos at TOP of ad. 4L x 3W x 3H FIRE BOX. 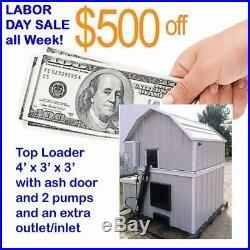 Load with your dump truck, backhoe, fork lift or front-end loader! Or Load from the side safely by hand in case of hydraulic or battery failure or repair! Ashes are cleaned out through the smaller door, below the side firebox door. Large Top Loading Furnace! Load it with even MORE logs for even longer burn times in your log burner! Don’t load your log burner furnace multiple times per day as you do with traditional wood stoves. All types of fuel can be used to create hot water (heat) such as stumps, wood chips, brush, wood by-product, pelletized wood and of course, almost 4 foot long logs! This product is manufactured in Arkansas but made for the Great White North. RANCO Digital thermostat STANDARD with temperature readout. Standard (Armstrong Astro 30) pump to circulate the water to your shop/home, in addition to the one that circulates water from the bottom tank to the lid , to prevent hot spots. 316 Gallons for maximum reserve; over 300,000 BTUs in reserve, available to heat your home or building even if the fire goes out (due to no wood). Load with almost 4 foot logs ; no cutting or splitting! 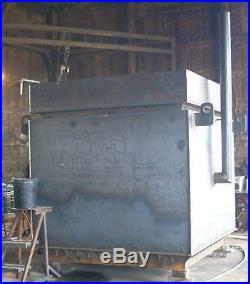 4 foot long firebox X 3 feet wide X 3 feet tall = 36 cu. Based on firebox (wood) capacity, it will heat 9,000 sq. In a PA type climate, loading it just twice a day with a good hardwood – like oak or maple; assuming the building is well-insulated. You could heat a 4,500 sq. Ft building, loading it just once a day. You could heat a 2250 sq. Ft building loading it once every two days. There is no negative to getting a bigger furnace because it is not like purchasing an air conditioner where if you get one too big, it becomes inefficient. It is simply like getting a bigger fuel tank so that it will hold more fuel and you will need to fill it less often. Comes with two pumps ; Armstrong Astro 30. One to circulate the water from the tank in the bottom to the lid, so that there aren’t any hot spots and one to circulate the water to the building (may need to be upgraded, depending on application, distance, elevation change, etc). 12V Car or Deep Cycle Battery (to operate rams/lifts during any power outage) not included. Can be charged with simple solar panel or simple trickle/float charger. Side door for safer hand loading too AND ash clean-out! 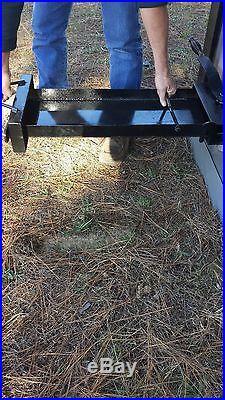 1300 lb lid acts like a trash compactor , smashing the logs info the firebox, with its weight and the hydraulic rams. 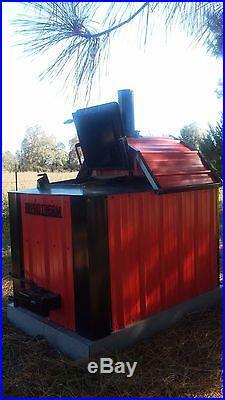 Can be made as a gasification unit just like all of our other furnaces. This product is manufactured in Arkansas but made for the great white North! Our smaller BIG model: Model 316. 4 L x 3 W x 3 H FIRE BOX. Gallons in bottom, = 147. Gallons in top, = 169. Total gallons = 316. 36 cubic feet (Bigger than our biggest Front Loader – the 340 model). Based on firebox (wood) capacity, it will heat 21,000 sq. In a PA type climate, loading it just twice a day with a good hardwood – like oak or maple, assuming the building is well-insulated. We custom build every furnace for YOU , so when you order, you can specify YOUR choice of 20 great c o l o r s to best suit your surroundings! WE WILL CUSTOM BUILD ANYTHING THAT YOU WANT BECAUSE ALL OF THESE ARE BUILT TO ORDER! We just did one 9 feet long; another was 4 feet deep and another was 5 feet wide! 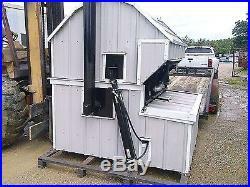 This shows the back but the furnace for sale is 2 feet shorter than shown here. 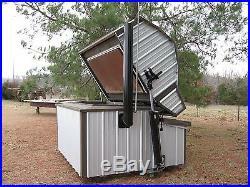 See photos at top of page.. /\ The furnace for sale is 2 feet shorter than shown here. \/ 4 new photos at the top of page. Automatic, solenoid activated forced-air induction fan/blower SHOWN HERE. (No electronics) The blower in the back is a great aid in getting a fire started and kept roaring – JUST LIKE A BLACKSMITH’S FORGE! . It also recovers the water temperature much quicker and burns the wood up more completely because oxygen is being fed to the bottom of the flame – like a blacksmith feeds his fire! View of port where the air blows in underneath (below)! 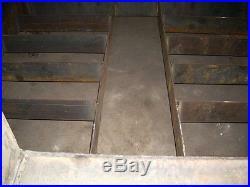 The grate (still being welded in this picture) is made out of 3/4 inch bar stock. Raised lip on base, to seal lid, shown here Extra wide rope seal; wraps around the raised lip on the base, to seal the lid. Note the plate of steel, that is raised off from the lid, with a nice air insulating air gap. Logs can cost up to 2/3 less than split wood and burns more efficiently due to size. No need to cut and split wood, just put whole logs in and close the lid. Heat very large buildings. 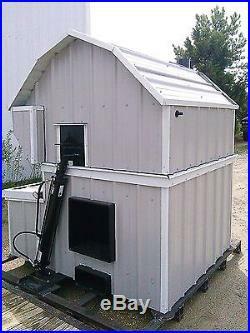 Such as: Greenhouses, Barns, Drive sheds, Garages, Shops, commercial buildings, etc. Load your Log Burner with machinery such as dump trucks, tractors, backhoes and fork lifts. On-Site and 100% paid! Who else offers that, who has been around 44 years? A lot of warranties only cover parts (not even labor)! A gentleman called me and told me his 2-year old C_____l B____r was leaking! All major problems such as leaks 10 years coverage on the water jacket Building Quality Wood & Coal Furnaces for 44 Years! Over 8,000 Different Color Combinations! 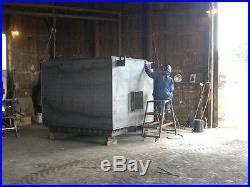 HyProTherm Furnace is a privately held company and was established in 1972. A Heating and Air company preceded it and dates back to 1950. Billy and his Dad, Gerald, were in the heating and air business for decades. They began to develop their first prototype for their own home, in the 60’s. Gerald knew there had to be a better way than to pay for oil, even though it was cheap back then. His main concern however, was to get rid of the smoke and ashes in the house. It was obvious it could cause serious health problems. Besides the soot all over the place was a chore to clean. Having the wood outside already, made the plan simple. Put the wood stove outside! Stick something like a heater core from a car in the plenum and it would radiate heat – and the hot water could be pumped from the outside. He developed a model for himself and continued to improve on it over the years. We were indeed the first! The last revision was made in 1978 and the furnace remains essentially unchanged, except for cosmetics, today. Now Gerald’s son, Billy heads up the business. We have been in business for 44 years and we are a family run business. We are a brick and mortar business in Salem, Arkansas and we are here to stay. We stand behind the quality of our furnaces 100%. We believe that we can give you a quality furnace and save you thousands of dollars on these great furnaces, at the same time. See My Great 100% Perfect Feedback! Apr-05-98 in United States. 100.0% perfect feedback. 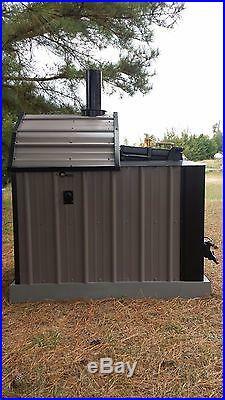 The item “TOP LOADER Log Burner Outdoor Wood Burner Boiler Furnace Stove Outside 21,000 sf” is in sale since Monday, July 24, 2017. This item is in the category “Home & Garden\Home Improvement\Heating, Cooling & Air\Other Home Heating & Cooling”. 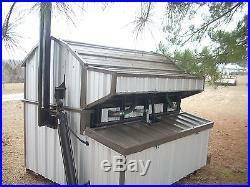 The seller is “aware” and is located in Salem, Arkansas. This item can be shipped to United States. ONLY During our August SALE. Ends August 31st. NEW FEDERAL EPA LAWS are in effect now! 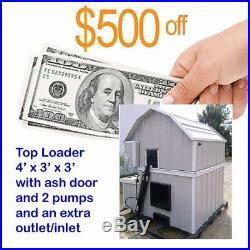 For commercial purposes, a shop, garage, greenhouse, heat a pool, etc. FOR A RESIDENCE are now. In ALL 50 STATES! (A new FEDERAL EPA LAW kicked-in nation-wide on Jan 1, 2016). That means folks who have a shop (body, wood, auto, etc) or commercial business, greenhouse, barn, pool, etc. Wood Boilers are still available in Canada, the U. Spain, Europe and other countries overseas! People simply hate how the EPA boilers are HARD to START and that it’s a full-time job to keep them running because the wood HAS to be dried, under cover, for a minimum of two years! 500 (1/2) inch thick! Will heat up to 128,000 sq. 6’L x 6’W x 6’H FIRE BOX. 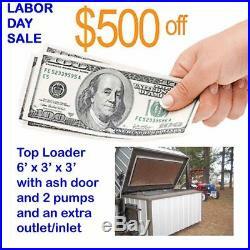 Load with your dump truck, back hoe, fork lift or front-end loader! Or Load from the side safely by hand in case of hydraulic or battery failure or repair! 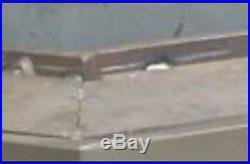 Ashes are cleaned out through the smaller door below the side firebox door. Ash trays are available! Large Top Loading Furnace! Load it with even MORE logs for even longer burn times in your log burner! Don’t load your log burner furnace multiple times per day as you do with traditional wood stoves. All types of fuel can be used to create hot water (heat) such as stumps, wood chips, brush, wood by-product, pelletized wood and of course, almost 6 foot long logs! This product is manufactured in Arkansas but made for the Great White North. RANCO Digital thermostat STANDARD with temperature readout. Standard (Armstrong Astro 30) pump to circulate the water to your shop/home, in addition to the one that circulates water from the bottom tank to the lid, to prevent hot spots. 1328 Gallons for maximum reserve; almost 1,300,000 BTUs in reserve, available to heat multiple buildings, garages, shops, greenhouse, pool, riding rink, etc… Even if the fire goes out (due to no wood). Load with almost 6 foot logs ; no cutting or splitting! 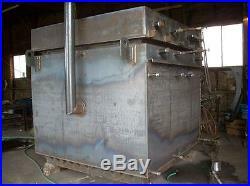 6 foot long firebox x 6 feet wide x 6 feet tall, not including the ash pan area = 216 cu. Compared to a max of 54 cu. Ft with our 450 Top Loader model (over 4 times the capacity). Based on firebox (wood) capacity, it will heat 128,000 sq. In a PA type climate, loading it just twice a day with a good hardwood – like oak or maple, assuming the building is well-insulated. 6 feet, 7 inches long. W x 6 D x 6 L FIRE BOX. Gallons in bottom, = 544. Gallons in top, = 784. Total gallons = 1328. 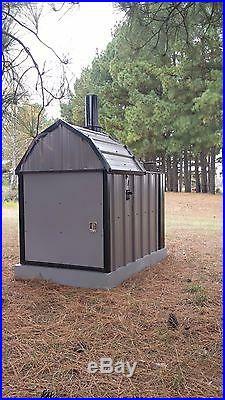 Firebox Capacity: 216 cubic feet. BTU: 1,296,128. 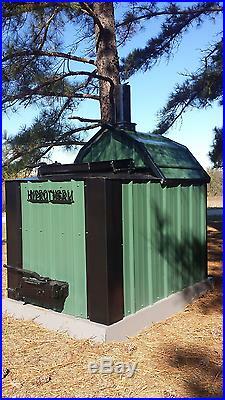 Based on firebox (wood/fuel) capacity, it will heat. You could heat a 64,000 sq. Ft building, loading it just once a day. You could heat a 32,000 sq. Ft building loading it once every two days. You could heat a 16,000 sq. Ft building loading it once every 4 days! There is no negative to getting a bigger furnace because it is not like purchasing an air conditioner, where if you get one too big, it becomes inefficient. It is simply like getting a bigger fuel tank so that it will hold more fuel and you will need to fill it less often. And one more Astro 30 to circulate the water to the home/shop etc. (may need to be upgraded, depending on application). 12V Battery not included. Can be charged with simple solar panel or simple trickle/float charger. Side door for safer hand loading too AND ash cleanout! Massive, over one ton lid acts like a trash compactor , smashing the logs info the firebox, with its weight and the hydraulic rams. 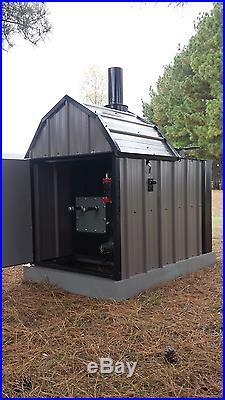 Can be made as a gasification unit just like all of our other furnaces. This product is manufactured in Arkansas but made for the great white North! Our BIGGEST: Model 1350. WE WILL CUSTOM BUILD ANYTHING THAT YOU WANT BECAUSE ALL OF THESE ARE BUILT TO ORDER with YOUR choice of 20 different colors! Automatic, solenoid activated forced-air induction fan/blower. The blower in the back is a great aid in getting a fire started. It also recovers the water temperature much quicker, and burns the wood up more completely because oxygen is being fed to the bottom of the flame – like a blacksmith feeds his fire! View of port where the air blows in underneath (below)! 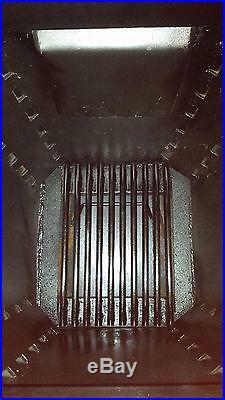 The grate (still being welded in this picture) is made out of 3/4 inch bar stock. Raised lip on base to seal lid Extra wide rope seal that wraps around the raised lip on the base, to seal the lid. Note the plate of steel, that is raided off from the lid, with a nice air insulating air gap. Logs can cost up to 2/3 less than split wood and burns more efficiently due to size. No need to cut and split wood, just put whole logs in and close the lid. Heat very large buildings. 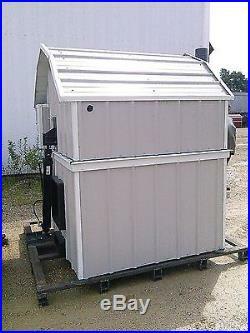 Such as: Greenhouses, Barns, Drive sheds, commercial buildings, riding rinks, pools, etc. Load your Log Burner with machinery such as dump trucks, tractors, back hoes and fork lifts. On-Site and 100% paid! Who else offers that, who has been around 44 years? A lot of warranties only cover parts (not even labor)! A gentleman called me and told me his 2-year old C_____l B____r was leaking! All major problems such as leaks 10 years coverage on the water jacket Building Quality Wood & Coal Furnaces for 44 Years! Over 8,000 Different Color Combinations! 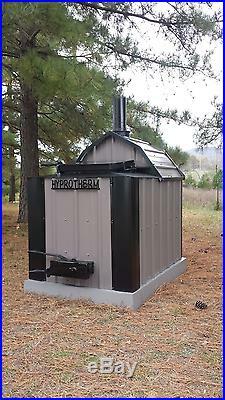 HyProTherm Furnace is a privately held company and was established in 1972. A Heating and Air company preceded it and dates back to 1950. Billy and his Dad, Gerald, were in the heating and air business for decades. They began to develop their first prototype for their own home, in the 60’s. Gerald knew there had to be a better way than to pay for oil, even though it was cheap back then. His main concern however, was to get rid of the smoke and ashes in the house. It was obvious it could cause serious health problems. Besides the soot all over the place was a chore to clean. Having the wood outside already, made the plan simple. Put the wood stove outside! Stick something like a heater core from a car in the plenum and it would radiate heat – and the hot water could be pumped from the outside. He developed a model for himself and continued to improve on it over the years. We were indeed the first. The last revision was made in 1978 and the furnace remains essentially unchanged, except for cosmetics, today. Now Gerald’s son, Billy heads up the business. We have been in business for 44 years and we are a family run business. We are a brick and mortar business in Salem, Arkansas and we are here to stay. We stand behind the quality of our furnaces 100%. We believe that we can give you a quality furnace and save you thousands of dollars on these furnaces, at the same time. See My Great 100% Perfect Feedback! Apr-05-98 in United States. 100.0% perfect feedback. The item “Top Loader Log Burner Outdoor Wood Burner Boiler Furnace Stove Outside 128000 sf” is in sale since Thursday, April 27, 2017. This item is in the category “Home & Garden\Home Improvement\Heating, Cooling & Air\Other Home Heating & Cooling”. 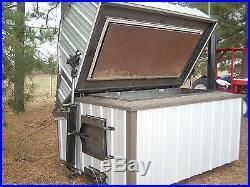 The seller is “aware” and is located in Salem, Arkansas. This item can be shipped to United States. A WORK IN PROGRESS. More photos just added! See photo of man at furnace, for a more realistic idea of its actual size and how easily it can be loaded! Look at Our Newly Designed Fireboxes When we decided to reinvent the wheel we knew that we had to start at the beginning and to us that meant the firebox. That is why at the heart of every HyProTherm furnace is a firebox unlike any other in the industry. Based on the knowledge that fire naturally rises and as it does it creates currents of air, we designed our HyProTherm fireboxes to maximize this potential. By utilizing the upwards drafting, funnel shape of a tornado, we have created a furnace that will burn coal or wood with almost no assistance from a combustion blower. Not only that, but our design will burn green sawdust, shavings, pellets, corn, or virtually any biomass that you choose, and due to its shape it will burn more evenly, completely, and with less stirring of coals. It is also the only firebox that allows for the use of the entire firebox. Because there is no flue pipe in the way and by utilizing our top loading feed door our fireboxes hold more than a comparably sized horizontal firebox (as shown below). Standard Furnace (horizontal fire box). 13.00 CF (useable). 16.15 CF (total, non useable). 15.31 CF (total, non useable). Standard HyProTherm (VERTICAL FIREBOX). 12.48 CF (useable). 12.48 (total useable). 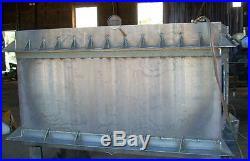 125 gallon water cap. North American Insulation Manufacturers Association. To Hyprotherm Manufacturing: Points of interest 1-4. In reviewing your request on your Forced Air Models and your commercial Hydronic models. We know you feel a need for a desired product. There are a number of materials that would work for your commercial hydronic and forced air stove. The high temperature fiberglass you cite below is one; there are also fiberglass and rock wool (which has a higher melting temperature) and the ceramic fiber materials (very high temp). In our opinion you will need. For the project youre looking at I think max operating temperature and corrosion resistance would be important as well as workability. Blanket materials are more flexible than boards and blocks. There are products you should not use for a thermal cycling unit. Do not use a standard fiberglass insulation meaning the standard fiberglass your using is just metal building insulation with an R factor on it tested at 75 degrees, exceeding that perimeter heat factor the R factor drops dramatically. Results to following proper recommendations. Based on our knowledge and the understanding of your needs, by using our recommendations and HVAC normal codes per efficiency, you should get the results you desire. Thank you for your eagerness to do all you can to manufacture the best product available. HyProTherm Standard Insulation Package. Based on the NAIMA formula thickness / k value = R value. Three inches of Knauf ET Blanket = R 10.71. One quarter inch Solar Guard = R 11.6. HyProTherm side wall standard insulation. Note: operating parameters, temp -10 deg, 5 mph wind, 150 deg operating temp = -1.6 deg. 8.4 deg differences (wow) see chart below. Two inches of Morgan Super Wool Blanket. Note: operating parameters, temp -10 deg, 5 mph wind, 700 deg interface temp = 22 deg cold face temp. Increase system efficiency and decrease fuel usage. Lightweight and easy to handle and fabricate. Flexibility makes them ideal for flat or irregular surfaces. More resistant to abuse than standard ET Blanket. Easy opening, Gas Spring Assisted Top Loading Fuel Feed Door. At HyProTherm we strive to bring new ideas and new technology to the furnace industry. This is why we are proud to introduce our new easy opening, gas spring assisted feed doors. Each Hyprotherm furnace has a set of custom designed STABILUS gas springs that assist the opening and closing of the fuel feed door. JWF Technologies a world leader in the design and manufacture of gas springs has worked closely with HyProTherm to make this happen. Utilizing its considerable resources, JWF Technologies has created for HyProTherm custom designed STABILUS gas springs for every model and every door size. Coal COMMERCIAL GRADE for Residential. Fire Box Cubic Feet. Water Jacket T hickness (sides, top). Water Jacket Thickness (bottom). The item “TOP LOADER Log Burner Outdoor Wood Burner Boiler Furnace Stove Outside 4,000 sf” is in sale since Wednesday, April 26, 2017. This item is in the category “Home & Garden\Home Improvement\Heating, Cooling & Air\Other Home Heating & Cooling”. 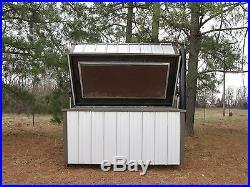 The seller is “aware” and is located in Salem, Arkansas. This item can be shipped to United States.